The world's largest organic winery was just named "Winery of the Year" by Wines of Chile. Emiliana Winery has more than 2,800 acres (1138 hectares) of vineyards, half of which is certified organic or biodynamic. The nearly 1400 acres that are not yet organic are converting to organic at a rate of 400 acres (162 hectares) per year Emiliana was established in 1986 and since then has been a remarkable example of the economic viability of organic and biodynamic farming. If global warming is an increasing issue, Emiliana is offering one green-centric way to warm up to the future. Emiliana has leveraged the financial power of its parent, the huge Concha y Toro wine group, to open new markets and push for a global presence. This stands in contrast to many biodynamic properties that are working on a boutique scale and don't have the capacity to do much on the international wine stage. Along with France's Maison M. Chapoutier, Emiliana takes a very visible role in advancing the visibility of biodynamic production and that is one of the elements that prompted this award from Wines of Chile, the promotional group representing 90 Chilean wineries in the international market. I've been a fan of Emiliana for many years and have watched as the quality of the wines has increased along with the winery's visibility. It seems to me that Wines of Chile's selection of Emiliana as Winery of the Year is a great vote of confidence in organic farming in the wine industry. Chile is one of the world's leading producers of organic fruits and vegetables - this is by no means a mindset limited to grapes alone. Chile is also an unusual wine producer in that nearly 95 percent of the country's wine is exported. To be successful at that level of export, a country has to balance several factors - good price, high quality and a keen awareness of what the wider world wants. The success of Emiliana shows not only the savvy skill of a single property, it also demonstrates that the country as a whole has identified an area where it can prosper. I well remember my first visit to Emiliana when biodynamics was considered akin to witchcraft by those who did not understand its precepts. Fernando Pavon, Emiliana's export manager, took me around the vineyard and gave me my first opportunity to, literally, dig in to biodynamic soil, to walk through the cover crops of manzanilla (chamomile) and other herbs that rejuvenate the soil and keep pests at bay, the flowers that provide end caps to rows of vines and nurture beneficial organisms (like ladybugs) and the specialized composting that provides a regenerating cycle of nutrients for the land. And then there were crystals. Rudolf Steiner, the founder of biodynamic agriculture, called for crystals in the vineyard. I had envisioned golf ball-sized chunks of quartz scattered about, but at Emiliana I saw powdered quartz mixed with water and sprayed on the vines to increase refraction of the light. Concepts fell into place, things made sense, and when I tasted the wine I became a fan. Emiliana is in the Casablanca Valley, on the road linking the port of Valparaiso with the capital of Santiago. It has one of the most carefully constructed and informative visitor centers in the region, an excellent restaurant and a friendly tasting room. And it has llamas - a treasured part of the compost and pest control system, as are the chickens and a flock of peacocks who stand as majestic sentinels on fence posts and stone walls throughout the vineyard. You do not have to walk around the vineyard and sidestep piles of compost in the making to taste the results of Emiliana's efforts in your glass. The advantage of Chile's export orientation and Emiliana's wide distribution is that the wines are widely available. One of the most accessible and successful of Emiliana's wines is the bright sauvignon blanc that hits a persuasive mid-point between the over-the-top herbaceousness of some New Zealand sauvignons and the richer, fig-scented style often produced in California. Among the reds, I'm particularly fond of Emiliana's top-tier Coyam, made with fruit from a biodynamic vineyard in the Colchagua Valley. The name Coyam refers to the oak used in aging the wines for 13 months, a combination of 80 percent French Oak barrels and 20 percent American oak barrels. This blend of six grape varieties (almost half syrah, and the remainder a combination of carmenère and merlot with a small amount of cabernet sauvignon, mourvedre and petite verdot). 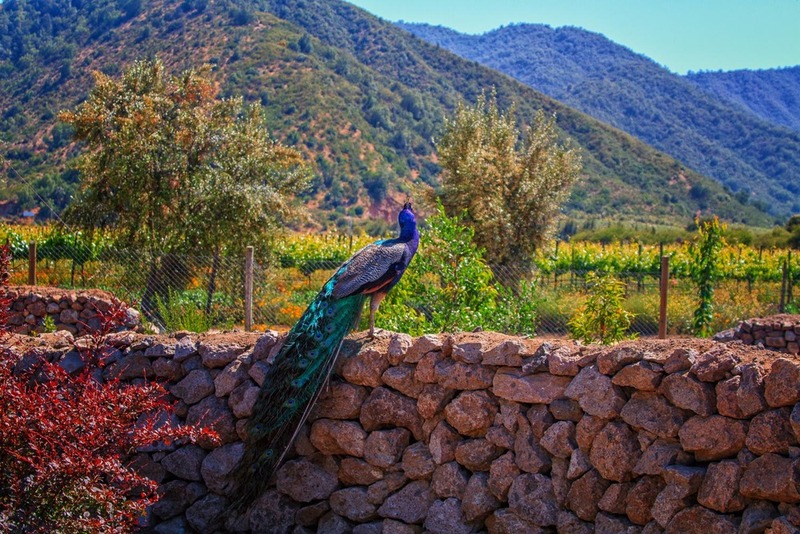 One of Emiliana's "Vineyard Sentinels"
I have visited Emiliana a few times, and featured its wines in many tastings in both North and South America over the past few years. I like the wine in large part because it is a great value and a wonderful wine, but I have to admit there is a non-vinous element that appeals to me as well - it's the spirit of Emiliana. Here is a winery, owned by a large wine corporation, the sort of entity that to many wine lovers these days represents a lack of humanity in wine. And yet, it is the humanity of Emiliana that speaks most immediately to me. This winery, so deeply concerned for nature and the environment, gives each of its workers a garden plot on the property where they an grow vegetables and other crops for their families. This sense of stewardship is deep at the heart of biodynamics and organic agriculture, and it is a guiding philosophy at Emiliana. Does it affect the taste of the wine? That would be hard to measure in scientific terms, by why wouldn't "spiritual terroir" be just as important as the geologic variety?